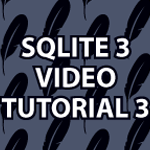 Welcome to part 3 of my SQLite3 Tutorial! Here I will cover a TON of commands for SQLite3. If you want a video that covers a ton on SQL you are in the right place. All of the following are covered in the video and the code that follows: SELECT, FROM, WHERE, COLLATE, NOT NULL, DEFAULT, UNIQUE, CHECK, FOREIGN KEY, REFERENCES, ALTER, ADD COLUMN, RENAME, AND, OR, LIKE, NOT LIKE, ORDER BY, LIMIT, OFFSET, AS, UPDATE, DELETE, and more. I also cover a bunch of arithmetic, boolean, bitwise, relational and other operators.